The Department of Architecture aims to develop highly-educated planners, designers, engineering professionals and researchers who possess global perspectives and exhibit rich creativity and artistry. Our mission is to enable our graduates to contribute to constructing sustainable cities in harmony with their environment and safe, esthetics and functional architectural space. 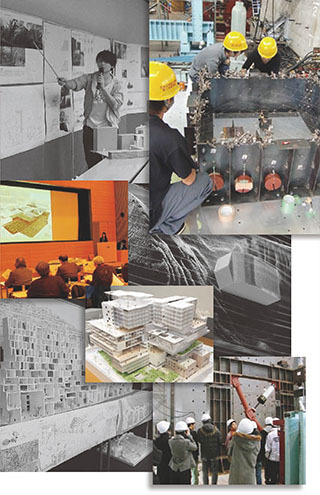 The Architecture program has the longest history in the Graduate School of Science and Technology, having been founded in 1951 together with three other courses - Mechanics, Electronics and Applied Chemistry. The Department of Architecture, College of Science and Technology, was originated by Dr. Toshikata Sano (1880-1956), a leading engineer and a pioneer of earthquake-resistant architectural design in Japan. With many graduates working actively at the forefront of architectural design all over the world, the Department of Architecture is one of the most prestigious institutes of Japan. Faculty was recruited in recent years to include architectural design, city planning and environmental engineering of architecture in the curriculum, and laboratory activity has been widely expanded. The Graduate program in Architecture extensively covers areas closely related to lifestyle, society and the environment. The faculty consists of active and talented professors whose specialties range from architectural and environmental engineering fields to interdisciplinary fields including urban sociology, history, arts and design. The Master’s program provides lectures on the latest topics and studio design practices. Students are required to conduct research and design projects on their chosen themes and to complete their study under the guidance of their professors. The doctoral program aims to provide students with opportunities to advance their research capabilities and enhance their design skills and technique.